The majority of skiing injuries occur traumatically, often the result of a fall or collision with another skier or object, such as a tree. 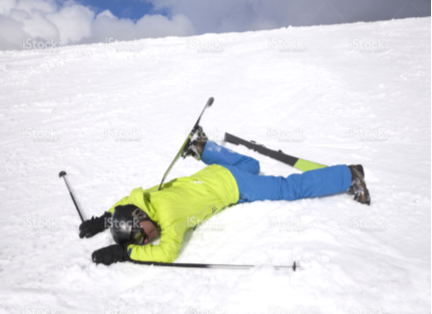 Skiing injuries commonly involve the knee, shoulder, wrist, thumb, head and neck. These injuries often include ACL and MCL ligament sprains/tears, medial meniscal tears, quadriceps and groin muscle strains, thumb joint sprains and shoulder dislocations, fractures and bruising, and often concussion, with some being quite serious requiring surgical management. If you do receive an injury, the best advice is to get it treated as soon as possible. Prior to treatment – initial RICE management is suggested (Rest, Ice, Compression, Elevation). Avoid alcohol, and no APRE ski. If you do require treatment, PhysioFit will endeavour to help you within 24 hours. Please phone 03 9707 4452 to book an appointment. Physiotherapist have been treating ski injuries for years and have been able to produce an accurate account of the “how, when, who, why and where” of injuries. Last hour before finishing – the body is well fatigued by now and hunger/thirst begins to take over. Skiing conditions can also become a little harder late in the day. Snow-boarders should use gloves with wrist guards to avoid wrist fractures during a fall. Injuries do occur however careful you may be. Our physiotherapists understand the mechanism and treatment of ski injuries so you can trust that you will be in good hands in the unfortunate event of an injury. Mark explains the “RICE” and “HARM” rule for acute/fresh injuries…. Ice therapy (cryotherapy) can relieve symptoms caused by sprains, strains, bruises and tendinitis – it can virtually be used in any situation in which superficial tissues are inflamed by trauma. It can also assist in recovery from repetitive strain injuries such as tendinitis, and it works by reducing blow flow to the injured areas, thus reducing inflammation and swelling that causes pain. Ice should be applied immediately after your injury, for 15 minutes every two hours, over the first 48 hours (also keep in mind the RICE rule with acute injuries – Rest, Ice, Compression, Elevation). Heat therapy works by improving circulation and blood flow to a particular area due to increased temperature. Increasing the temperature of the afflicted area even slightly can soothe discomfort and increase muscle flexibility. Heat therapy can relax and soothe muscles and heal damaged tissue. Heat can be used before (not after) activities that irritate chronic injuries such as muscle strains and overuse injuries, and can help loosen tissues and relax injured areas. Heat should not be applied for longer than 20 minutes at a time. Of course, please consult your physiotherapist for professional opinion and management of your injury.